Japan's best milk and butter come from the northern island of Hokkaido, where dairy farming is said to have begun in Hakodate city in 1857. Butter is not a traditional part of the Japanese diet, though it has become common since the 1960s, when westernisation of the Japanese diet increased the demand for milk and dairy products. Japan now consumes nearly 90 million tons each year, or about 0.8 kg per person. That is about a third of what Americans eat, and a tenth of the French or Germans. 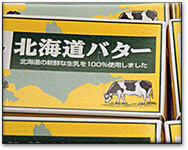 It was not until the mid 19th century that that dairy was common in Japan. Butter in a Japanese supermarket. In the latter 1800's, "Ayrshire," and later Holstein-Friesian cows were imported. Then, in 1923 Hokkaido invited dairy farmers from Denmark to show them how to run a dairy operation, after which dairy farming became an established industry. Help grow this exhibit with your photos! WebExhibits helps connect people and cultures, and you can join in by sending photos of butter from your part of the world. Read more about sharing your photos.